A set of of modular Excel-based software tools for the construction and analysis of investment portfolios. Applications for asset allocation and portfolio optimization, style analysis, correlation analysis, factor analysis, the Monte Carlo simulation of future risks and returns, value at risk analysis, and retirement planning. The Hoadley Finance Add-in for Excel containing a comprehensive set of portfolio analytics for asset allocation, investment performance analysis, portfolio optimization, and risk management. Additional samples available for download which provide more examples (in addition to those provided with the Finance Add-in for Excel) of using a number of the asset management functions. See Additional Samples for details. The following applications are available for portfolio analysis and design. A mean-variance optimizer (MVO) application for analyzing and optimizing a portfolio of stocks and other assets using Modern Portfolio Theory (MPT) & Capital Asset Pricing Model (CAPM) principles. Outputs include an efficient frontier, a full set of active asset management statistics, risk attribution analysis, and leverage analysis. Price: Included in the price of the Finance Add-in for Excel. The Hoadley Black-Litterman Returns Estimator enables investors to estimate asset returns using the Black-Litterman asset allocation model. Using market equilibrium returns as the starting point, investors can apply views or tilts to produce "blended" returns and optimal portfolio weights which more closely reflect their views about future performance. Designed to be used interactively for rapid scenario evaluation and prototyping. The Style Analyzer analyzes the investment style of a portfolio or mutual fund against two or more indices, asset classes or other benchmarks using the returns-based methodology originally developed by William F Sharpe. The objective is to determine the combination of indices, style benchmarks, or asset classes that best represents the exposure of a fund or portfolio to these "benchmarks". The Style Analyzer also includes an analysis of drawdowns. 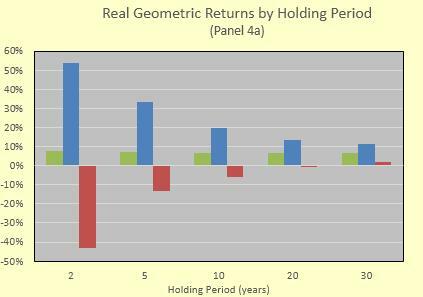 An application for analyzing the future risks and returns of a portfolio using Monte Carlo simulation. Simulation can help gain an understanding of the probabilities of achieving future returns and the impact of various rebalancing strategies on future outcomes. Price: Included in the price of the Finance Add-in for Excel..
An application for simulating Value at Risk (VaR) and Conditional Value at Risk (CVar). Three types of simulation are available: Monte Carlo simulation, simulation using copulas, or Filtered Historical Simulation (FHS). Performs a hierarchical cluster analysis to identify groups of assets which are closely related based by correlation. Outputs include a clustered correlation matrix, with rows and columns re-ordered to highlight clustering, a cluster heat map, a hierarchical cluster diagram, a merged correlation matrix of clusters, and a step-by-step analysis showing how individual assets and groups of assets are progressively combined into a hierarchy of clusters. The Hoadley Factor Analyzer performs regression analyses using the Fama-French three factor model, and the Capital Asset Pricing model. The analyses can be undertaken on individual US equity assets (stocks, ETFs, funds) and on a portfolio of assets. Data is downloaded for the specified assets and all analyses run with a single button click. The outputs include an analysis of returns, risk decomposition (systematic, specific), factor loading analysis, regression statistics, historical rolling-window charts, and drawdown analysis. 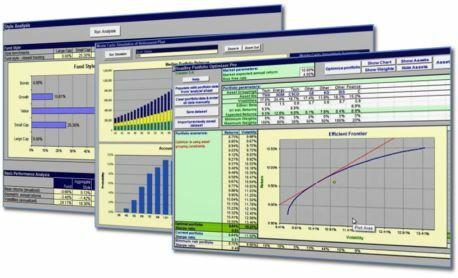 Two utility applications designed to help estimate inputs to a number of the above portfolio analysis and design applications. The Retirement Planner uses Monte Carlo simulation to produce a retirement plan based on a pre-retirement savings and investment plan, and expected expenditures during retirement. The Hoadley Finance Add-in for Excel includes Excel functions for portfolio analysis, asset allocation using Black-Litterman, portfolio optimization (MVO), risk management (VaR), volatility, correlation and covariance calculation, and more. The Finance Add-in for Excel also includes functions for the analysis of options and other derivatives. The add-in's functions can be invoked directly from spreadsheet cells or called from VBA modules/Macros. The Hoadley Finance Add-in for Excel is the analytical engine used by the Excel applications described on this page. It is only necessary to purchase the Finance Add-in for Excel; the Excel applications are included in the price of the Finance Add-in for Excel. Private (non-business) use: Pricing & purchase on-line. All tools & applications require Microsoft Excel (32-bit or 64-bit) running under Microsoft Windows. For detailed systems requirements, including supported versions of Windows and Excel see systems requirements.